January 11, 2019, 12:00 a.m. It has been said that Britain and America are two nations separated by a common language. 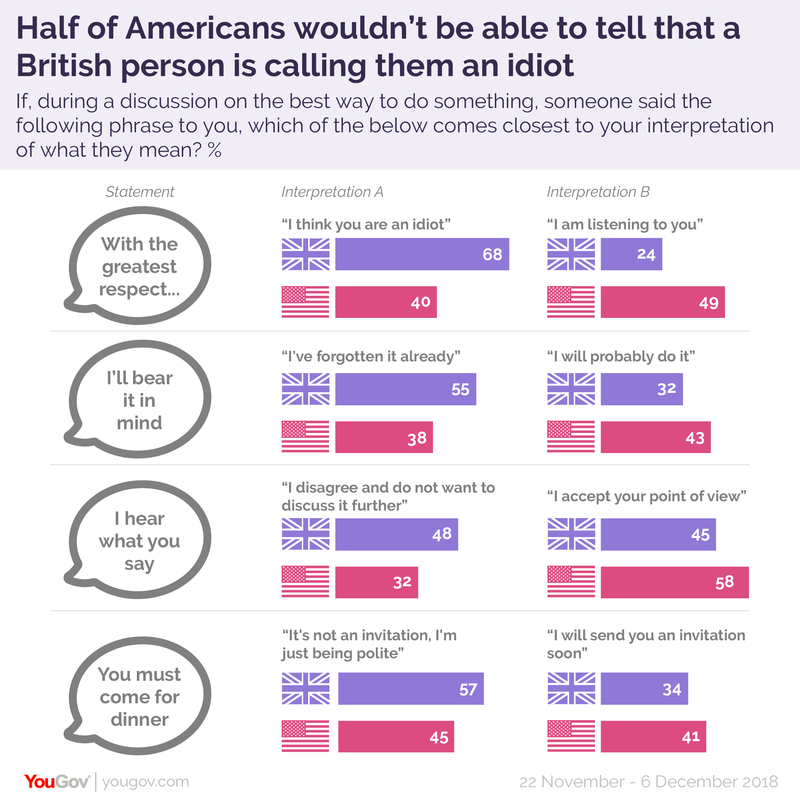 Now a new YouGov Omnibus survey reveals how Americans might find themselves in a pickle for having failed to understand what Britons really mean when they make certain statements. The survey is based on a humorous meme showing how foreigners don’t understand the subtext of British English. For fun YouGov Omnibus asked both Britons and Americans which translation they think is right. While not all the phrases show a difference in transatlantic understanding, there are some statements where many Yanks are in danger of missing the serious passive aggression we Brits employ. The most notable variation is over what “with the greatest respect” means. Here in the UK, the vast majority of us (68%) know that someone saying this to you is in the process of calling you an idiot. By contrast, only 40% of Americans believe the same – in fact they are more likely (49%) to take the statement at face value and believe it simply means “I am listening to you”. 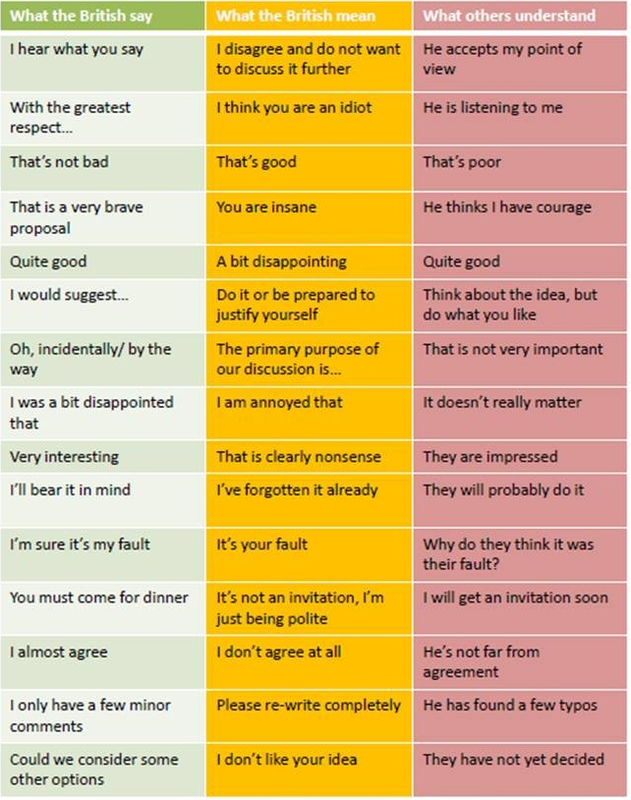 Americans are much less likely than Britons to feel that “I’ll bear it in mind” is actually code for someone having already discounted your point of view. The majority of Brits (55%) interpret the phrase as meaning “I’ve forgotten it already”, compared to only 38% of Americans. Similarly, Americans are less likely to feel fobbed off by the phrase “I hear what you say”. The majority (58%) believe it to mean “I accept your point of view”. While 45% of Britons believe the same, they are actually more likely to interpret the statement as meaning “I disagree and do not want to discuss it further”, at 48%. By contrast only 32% would understand the sentence to be an attempt to shut down debate. Americans in Britain are also in danger of actually expecting a meal when it is not forthcoming. If one Briton were to say “you must come for dinner”, the majority of us (57%) interpret that as being polite, rather than an actual invitation. Americans, however, are more likely than not (45% vs 41%) to think it represents a sincere invitation.